In the early-to-mid 1980s -- when I was in middle school and high school -- my best friends and I would sometimes walk down Benson Street in Glen Ridge to a diner on Broad Street in Bloomfield. Now, if you don't know this area of New Jersey (namely Essex County), that diner is not far from Holsten's in Bloomfield, the ice cream shop that appears occasionally in The Sopranos (1999 - 2007). We're going back more than thirty years now, so some of my memories are fuzzy,and I hope I have it right. I'm open to the fact that I may not. But I believe the diner opened in 1981 and was called the Nevada Dinner. We were kids, however, so we weren't going there to sit down and eat. Instead, we were going to play the arcade game in the diner; Spy Hunter, by Bally-Midway. It was an arcade unit, but not the kind that was designed for sit-down play. You had to stand, but at that age, we didn't care. We would play the game for a good long while, assuming we had enough quarters. 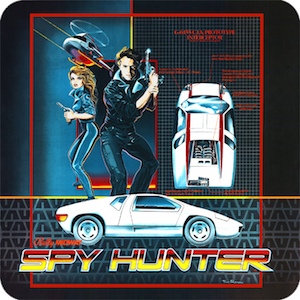 Spy Hunter was designed by George Gomez, and originally intended to be a James Bond video game. When the 007 license couldn't be acquired, however, the game was modified, and became Spy Hunter. But heck, you could still pretend to be James Bond while you played, even if the soundtrack song was not Monty Norman's, but Henry Mancini's theme from Peter Gunn (1958-1961). The field of play in the game, as you may remember, is a bird-s eye view. You are looking down at a snaking road, and a car speeding down (or rather, up...) that road. Your car is the G-6155 Interceptor, and it has been modified with such 007-ish "extras" such as an oil slick, a missile launcher, and a smoke screen. These instruments prove useful as you engage with many bad guy cars. While driving, you can also visit your mobile headquarters, a weapon's van, or convert your car to aqua/boat function, by pulling into a boat house. If memory serves, there are also, sometimes, icy conditions to navigate. I remember all of us buddies standing in a small alcove, in front of that arcade screen, trying to see how far we could get in the adventure. I guess the joke was really on us. 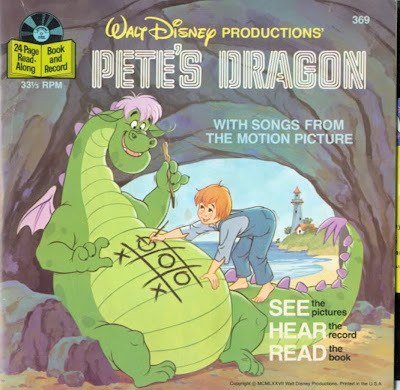 Not only because the Peter Gunn song is addictive, and it won't leave your thoughts no matter how hard you try, but because the game had no ending. It just kept on scrolling, forever. Spy Hunter...the endless James Bond-ish adventure. 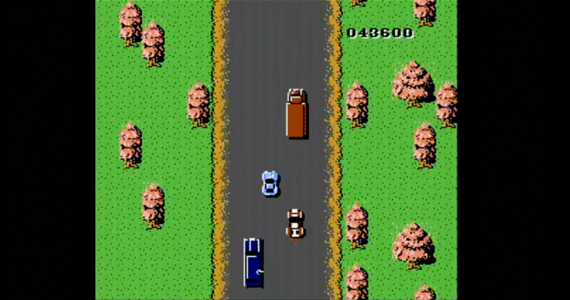 Soon enough, Spy Hunter was available in a home video game format. I had a game version for the Atari 800 home computer, I'm pretty certain. But it wasn't the same, somehow, as the arcade version. Somehow it was more fun hearing that music, driving that car, and playing that game with friends, after the walk to the restaurant. It was more fun knowing that you had a pocket full of quarters, and once they were gone, you were done...whether you liked it or not. 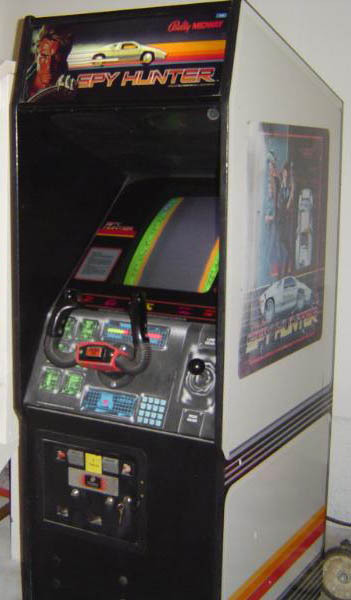 Of course, it was also very, very expensive to play the addictive Spy Hunter in a arcade setting, so I guess some memories seem more attractive with age and distance. I loved that game, and I was oh so horribly bad at that game! But I still loved it. I'll never forget the excitement I experience getting this game for my Commodore 64 for Christmas. I must've played that game more times than I can remember.